Burton, the kind scarecrow, invites his friend Ribbon to watch as Farmer Green works the field with his tractor. First, the farmer plows all of last year’s growth to make natural fertilizer, and then he readies the discer. He follows that with dragging tied-together wagon wheels across the field to make it smooth. After he’s picked up the rocks, the farmer tells Burton that he’ll return tomorrow to plant the seeds. Imagine the scarecrow’s concern when he doesn’t show up. After two days of waiting, Burton finds out from the crow that the farmer has broken both legs. Now he’s even more worried. What will happen to Farmer Green’s family if he cannot grow crops? Burton, always kind and thoughtful, bands the animals together to form a plan to help. Boeholt’s book, as Book 2 in the series called Friendship Tales from the Farm, is so much more than a book about farming. Teachers will surely appreciate the Resource Guide (included within the book), the page on the history of gardening, comprehension questions, the ideas for activities, and the glossary of words unfamiliar to many third graders. In addition, Burton’s Friendship Garden provides an opportunity to teach character development and service, as the scarecrow, alongside his friends, finds a way to work together to achieve a worthy goal. As Boeholt brings Burton to life, she’s able to reach children with that important message of friendship. 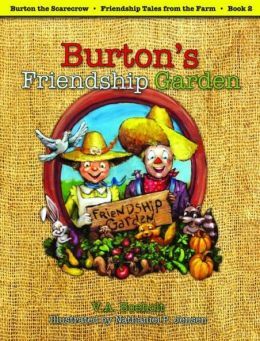 Read aloud or silently, Burton’s Friendship Garden should be near the top of the third grade reading list. Publisher: Five Star Publications, Inc.